Natural and organic ingredients will help your skin maintain its youthful glow. But what does it mean when a product says natural and/or organic? Organic Ingredients - In order for a product to be labeled "Organic", it must be formulated with at least 95% organically produced ingredients. If a product is claiming to be "made with organic ingredients", it must at least be 70% organically produced. Natural Ingredients - Natural skin care is when a naturally derived ingredient (such as herbs, roots, essential oils and flowers) combined with naturally occurring carrier agents, preservatives, surfactants, humectants and emulsifiers (everything from natural soap to oils to pure water)is used to produce the product. Whew! Now what about your skin and these products? There are some challenges that are affecting your skin and having knowledge of ingredients and the impact they have on your skin is important. One of the main challenges that you face as women of color is that of evening out your skin tone. While it might be the main challenge it's not the only challenge. 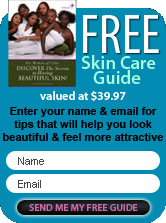 African American skin is also challenged with, dryness, oiliness and signs of maturing. Here are some of your skin challenges and a few natural and organic ingredients that will help you with the challenges you face when caring for your beautiful black skin. Dry Skin - Yes you can get dry skin. While we are definitely fortunate with a certain amount of moisture in our skin, there are those of us that are challenged with dry skin and dry skin patches. Hyaluronic acid is a natural component of your skin that helps in tissue repair. It boost the elasticity and hydration of your skin. It locks in moisture which will give your skin a youthful appearance and eliminate the appearance of dull dry skin. Oily Skin - While the myth of "all black women have oily skin" is just that, a myth, there are quite a few of you that are challenged with an over production of oil in your skin. Ingredients that are used for oily skin are used to reduce the oil and minimize the sheen that you see on your face. The over production of oil can lead to clogged pores, trapping bacteria in your skin and ultimately acne will introduce itself to your skin. One of the best natural ingredients to use for oily skin is Tea Tree Oil. Tea Tree oil, is a natural antiseptic that's made from the leaves of the tree. Native to Australia, tea tree oil will dissolve the oils and kill bacteria that can cause acne. A word of caution about Tea Tree oil, if you have been challenged with acne rosacea, Tea Tree oil could worsen your symptoms. Glycolic Acid is an Alpha Hydroxy Acid (AHA), that is used for oily skin challenges especially in peels. Applying a peel will help improve your skin's texture and overall appearance. Glycolic acid is derived from sugar cane. Salicylic Acid is a type of Beta Hydroxy Acid (BHA) that treats oily skin by neutralizing bacteria and opening up clogged pores. It comes from the bark of the willow tree and is known to help in breaking down blackheads and whiteheads by stripping off the outer layer of your skin. You would only apply this ingredient to the oily part of your face, your T-Zone area, never to the dry parts of your skin. Mature Skin or anti-aging ingredients are not always discussed when caring for African American Skin. But we do mature and as such many of you are looking for ingredients that will assist you in keeping your skin soft and subtle, young and vibrant and moisture rich. One of the main treatments for maturing skin is exfoliation . As your skin matures it does not shed dead skin cells as fast as it did when you were younger. What used to be a 28-30 cycle for cell renewal is now a 45-60 day process. If these dead skin cells are not removed, you'll begin to see and experience the appearance of dull and dry looking skin. Now as for ingredients, Lactic acid works very well on skin of color, considering that most people of color are lactose intolerant. It's extracted from milk. Remember the stories of Cleopatra always taking a Milk Bath? She knew what we knew not! Add 2 drops rose essential oil to a real milk bath and you've got a skin treatment made in heaven. Glycolic acid is also used on maturing skin. You'll find them in peels and peels are a form of exfoliation. Antioxidants reduce free radical damage to Maturing skin. Ingredients known to have antioxidant properties include, coenzyme Q10, grape seed extract, green tea, vitamins C & E and pomegranate. The most important thing to remember when caring for your beautiful black skin, is that everything will not work for you. This means it's trial and error time. Find a part of your body that will not be seen in public and test a new product or ingredient on this area. If it works there you're probably good to go on the rest of your skin. From time to time you might experience a tingle here or there, this is ok. But if your skin starts to burn, wrong product! Remove it immediately with cool water. A final ingredient to have for your skin is a spray mist made with distilled water and lavender or rose essential oil. Four ounces of water, 8-10 drops of lavender or rose essential oil in a container and you've got a soothing mist for your face. This is a calming mist for all skin types. This is a Basic 101 list of ingredients that are considered safe for your beautiful black skin. If you've enjoyed the article, share it with your friends.